Description: Formerly known as Prosuberites epiphytum. 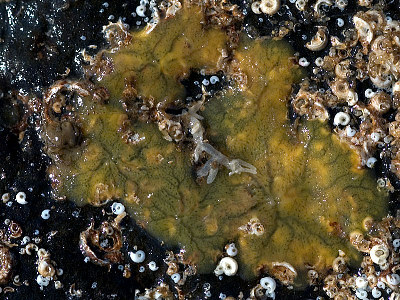 This sponge forms thin translucent yellow encrustations beneath boulders. It has a network of excurrent channels which converge on a few oscules. Habitat: Beneath boulders in places with wave or tidal stream water movement. Picton, B.E. & Morrow, C.C. (2016). Protosuberites denhartogi van Soest & De Kluijver, 2003. [In] Encyclopedia of Marine Life of Britain and Ireland.